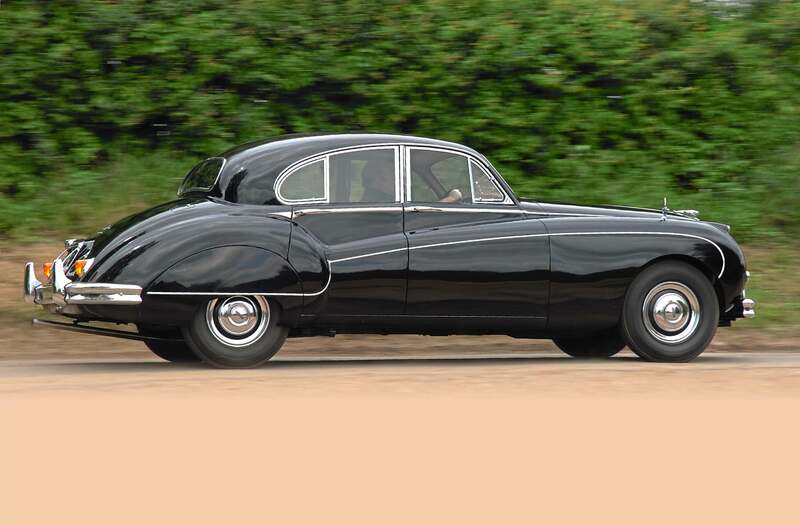 Cat of IX tales Jaguar’s Mk IX was the last of the separate-chassis cars, yet the first Jaguar with a 3.8-litre engine and such innovations as disc brakes and power steering as standard. We explore these developments and drive an example. Words & Photography Jim Patten. Our model profile of the Jaguar Mk IX on the advent of its 60th anniversary looks at the car’s development and the differences between it and the Mk VII and VIII. We take an example for a drive. The motoring world is full of what ifs, and although a number of stories surround the big Mk VII-IX range, the one indisputable fact is that the car was always planned and its future secure. Yet there were delays in getting the first cars into production, and that brought about the unplanned introduction of a single standalone model and an entire sports car range. History tells us that Jaguar had designed the most advanced twin-overhead camshaft engine that the production car world had ever seen. The original concept was to have an entirely new luxurious saloon car built around the new power plant that could be both docile and capable of the highest performance. Its delay, caused by production techniques, required swift action, and Jaguar’s reaction in 1948 was to design and produce the sensational XK 120 that went on to spawn the incredible XK range. For the new saloon, Jaguar played the conservative game by introducing the Mk V, a car that cynics deemed an interim model, but was, in fact, a very attractive car of its time. The production difficulties were eventually ironed out so that by 1950 the Mk VII was launched. It was a truly luxurious model, so well appointed that it could mix in the very best circles, and yet possessed a level of performance that no other luxury car could compete with. As if to push home its credentials, the Mk VII was untouchable on the circuits and went on to win the Monte Carlo rally outright in 1956. 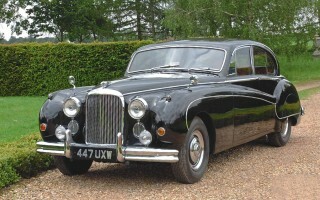 It was only knocked off its mantle when Jaguar introduced its compact range, using the same 3.4-litre engine. In what seemed like little more than a makeover, the Mk VIII slipped into the catalogue in 1956. Although it was similar to the outgoing model, the visual appearance was marked in subtle ways. A new, full-width, windscreen replaced the front split two-piece screen, while at the rear, the full wheel spats became cutaways. The small addition of a curved chrome strip following the wing and door swages allowed the interesting option of a two-tone paint finish. Using the B-type cylinder head (a modified version of that used in the C-type) as seen on the Mk VIIM, there was a useful hike in power. 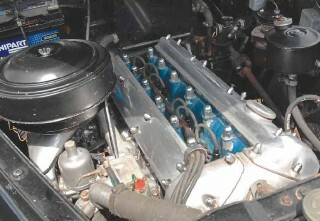 Yielding to pressure from the North American market, some Mk VIIIs were fitted with Burman power steering, with a Hobourn-Eaton eccentric rotor pump driving from the back of the dynamo. The number of turns from lock-to-lock was reduced to three-and-a-half, allowing ease of parking. The system worked well and found its way onto the options list. When the Mk IX was unveiled on Jaguar’s stand at the 1958 Motor Show, visitors might have wondered what all the fuss was about. Nothing seemed to have changed, yet this car was being billed as a new model. There were, in fact, no discernible differences between the new and the old, except perhaps the discreet Mk IX script on the boot lid. Jaguar had trifled with the idea of body upgrades; sketches exist of some casual meanderings, one idea being for a chrome flash mid-way up on the front wing. Fortunately, these ideas remained just ideas. The real changes were under the skin and significant they were, too. One important development advanced braking power. Jaguar had pioneered the development of disc brakes in close collusion with Dunlop. It was the inclusion of the new design that helped the C-type win the 1953 Le Mans race (and other events), followed by the success of the D-type. A version suitable for the road soon followed, but a need to be cost conscious stopped Jaguar from becoming the first to standardise the system. Triumph and Jensen were ahead of them. In a damning statement, Road& Track magazine had declared the 3.4 saloon to be positively dangerous, with so much power and so little braking effect – at that time, drum brakes were standard and discs were extra for both the 3.4 compact saloon and XK 150. For the Mk IX, though, there would be no such shortcomings. Not only were there discs all-round, but they were also larger and more efficient than those seen on the XK and compact saloon range. Calipers with a bore size of 2 ½in straddled substantial discs, far more effective than the 2 1/8in examples later used on the smaller models. I have always been puzzled over why Jaguar restricted the larger calipers to the Mk IX when they would have been so efficient on all models (especially the E-type that followed). But, of course, cost was always an important factor. At least with an excellent vacuum servo-assist the brakes proved supremely efficient. And they needed to be, for the Mk IX also had a larger engine. It isn’t known who first enlarged the 3.4-litre XK engine to 3.8. In the UK, Oscar Moore had over-bored the 3.4-litre engine in his HWM, although it is said that the Americans had beaten him to the mark. Certainly Briggs Cunningham had taken the capacity to 3,781cc (the same that Jaguar later arrived at) for its Le Mans effort. But, where the racers had simply over-bored the engine, Jaguar spent more time examining the implications and realised that in regular use there was the almost-certain fact that the block would crack between bores. So, for production, a completely new engine block was designed, with revised water passages to the front and rear sections effectively linking to two separate chambers around banks of three cylinders. Although the 3.4 block had been strong enough to bore each cylinder directly into the casting, dry liners were adopted for the 3.8 to eradicate the possibility of cracking. The bore was increased from 83mm to 87mm, but the stroke (and hence the crankshaft) remained standard at 106mm. There was no need to substantially alter the cylinder head, although the colour changed from duck-egg green to metallic dark blue, for identification. Gearbox options remained either four-speed manual (with or without overdrive) or automatic. The vast majority considered the automatic shifter to be more suitable for a car of this status and chose likewise. Seat design was similar to the Mk VIII, with a full front bench-type seat for automatic cars, or superb individual seats for the manual cars (with due deference to the floor-mounted gearlever). The power steering, as seen on the Mk VIII, was adopted as standard equipment. Again in response to demand in America, a true air-conditioning system (rather than cool air) was sought. Some re-arrangement under the bonnet was needed to accommodate the new system, so the single, large, 12-volt battery was changed to a pair of six-volt batteries that could sit either side of the steering column, thereby liberating space and conveniently allowing the unit to sit above the cabin vents. Surprisingly, few markets adopted air-conditioning, but the standard heater was improved to make it a very efficient system, rated at five kilowatts. None of these changes had too much effect on the price – the increase was a mere £165. If the manual-only option was chosen, a Mk IX came in at £6 under £2k, rising to £2,162 for the automatic. In today’s terms, that’s less than £45,000. America had by then started its horsepower wars and every manufacturer boasted artificial numbers. Jaguar was no exception, and, on paper, the 3.8 had a useful 10bhp gain over the 3.4, at 220bhp. But, it is the torque that matters. Rising from 216lb ft to 240lb ft, that equated to a much faster road car with a maximum speed of almost 115mph. There is a certain presence about driving a Mk IX, and although today it doesn’t look that big against the likes of the F-PACE, it has dominance on the road. Opulence is accepted – lashings of wood veneer and a herd’s worth of leather see to that. Such is the breadth of the front seat that the passenger could well be in the next village, while those seated in the rear could ignore everything around them as they enjoyed such luxuries as pull-down tables of sufficient size to take some bread and cheese alongside their glass of wine. Reading material could be stored in the lockable central magazine rack. Their only concern would be if the driver decided to exploit the power and push the handling to its limit. For such a big, luxurious car, the Mk IX was a nimble behemoth. Jaguar also made a handful of limousines. 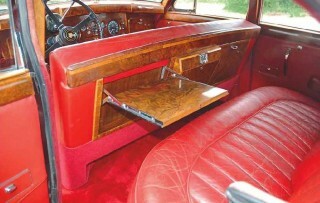 Built on the standard wheelbase, there was a chauffeur division, cocktail cabinet and extra ashtrays. Do any survive today? Outside of the factory, few specialists looked at upgrading the Mk IX; what else could be done that wasn’t already there? (although Harold Radford created an impressive picnic set, designed to hinge out of the boot). By 1961, it was all over for the separate-chassis cars, when the over-engineered, unitary construction Mk X slipped in beneath the wave created by the E-type. But Jaguar had achieved everything it set out to. From 1950 until 1961, an impressive 47,000 cars had been produced, and almost 10,000 were Mk IXs. One curious fact is that Mk VIII production continued into 1960, fulfilling orders to the military. Fortunately for the enthusiast, many cars have survived in good order, a worthy option to the otherwise huge restoration costs that would certainly deter most. Like all classics, they fell into a dark period, suffering indignities such as diesel engine transplants, or even a V8. But, in more recent years, the size and space has lent itself to some interesting upgrades. A conversion with an E-type engine, XJ-S brakes and improved handling was featured in Jaguar World Monthly more than ten years ago and proved very impressive. The late Bertil Backstrum, in Sweden, slotted the entire engine, transmission and undercarriage from a 6.0-litre XJ40 into a Mk IX. His brief was to terrorise the thundering Mercedes on Germany’s autobahn. Now, there’s a car to savour. Prices of Mk IXs are rising but these cars remain an affordable classic. Find a sound example and it will last several lifetimes. BELOW: This modified Mk IX has an E-type engine, all-synchromesh gearbox, uprated suspension and XJ brakes. Superb! BELOW LEFT: Unabashed luxury, with pull-down veneer tables, lockable magazine rack and a clock. BELOW: Darker metallic blue on the cylinder head marks this out as a 3.8. A modern – and small – high-power battery replaces the two six-volt ones in this car.